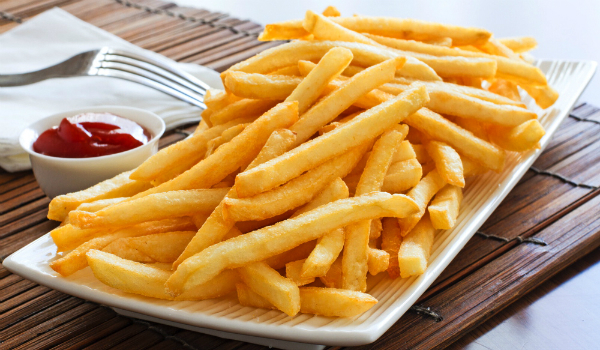 The Benefit of Potassium – There is a nutrition backed reason why French Fries energize you almost instantly. Potatoes are rich in potassium a sizeable part of which remains in the bag when converted into fries. So, when you consume these fries, you also consume a sizeable dosage of potassium which is one of the key elements that offer energy to the body. Potassium is also responsible for keeping depression and anxiety at bay. The Gift of Vitamin B6 – Vitamin B6 is an essential ingredient that helps in putting up a fight against diseases and illnesses. It also battles bloating and mood swings during the menstrual period. And yes, Vitamin B6 is present in French fries. Fiber and Good Carbs – French Fries contain a good dosage of fiber which assists healthy bowel movements. So, it is directly responsible for a healthy gut. At the same time, potatoes are usually a good source of healthy carbs when taken in moderation. However, you cannot completely ignore the fact that these otherwise delectable treats have been named to wreak havoc in the body when consumed without limits. In fact, it is known as the worst enemy of weight watcher’s. Deep fried and drenched in oil and then sprinkled with salt, such negative outcomes were only expected. This is followed by numerous studies that have linked French Fries with Type II diabetes, high cholesterol levels in blood, a range of heart diseases and even cancer. At the same time, it has also been named for triggering neurological disorders when consumed off limits. To make the best of the nutrition in French fries, it is necessary to make certain adjustments and amendments to make your bag of joy more compatible with your health. To begin with, you can switch the friendly everyday white potatoes with sweet potatoes which are healthier and better for your gut. Secondly, you can always opt to bake or, roast your potatoes than fry them. This is one of the best ways to enjoy the crispy outers while experiencing the advantage of minimum or no oil at all. Even if you choose to add a tiny dash of oil, try choosing olive oil in comparison with the rest. Thirdly, try making your plate of French Fries an accompaniment to healthy meals complete with fresh vegetables and lean proteins than eat is as a snack. This small move will ensure that you use these fries as your source of carbohydrates which will eventually get used up by the body for constructive purposes than store it as fat. Fourthly, it will serve you better if you make your fries in the house in more dependable surroundings than opt for the store bought frozen options or those from the fast food stations.